Automatical information verification application fault. 1. 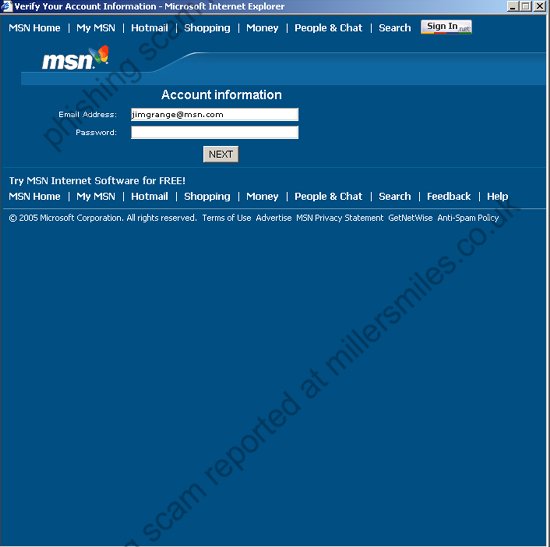 Email claims to be from MSN asking you to confirm your account data by clicking on the link. You will be taken to a spoof login page where your details will be captured by the phishers. 2. MSN never send users emails requesting details in this way. 4. Real URL looks like MSN - phishers have used a very similar domain name! 5. Clicking on the link also passes your email address to the phishers via a script on the spoof website. 6. Spoof website loads as a popup in front of the REAL MSN page to make it look authentic. 7. Email uses a clever trick to get past spam filters - it looks normal to the human eye, but try selecting some text and you'll see that every letter is in a separate table and they are all separated by dots, making it look like gobledegook to a filter. 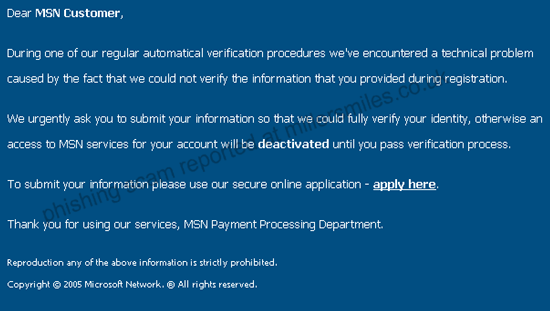 "Dear MSN customer, During one of our regular automatical verification procedures... "